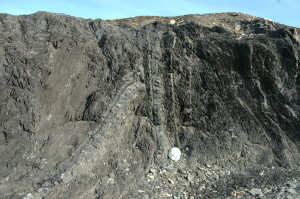 I promised you the Permian on Svalbard, after the Carboniferous. Well, the lower Permian on Svalbard was basically the same as the Upper Carboniferous, and 300 million years ago is sooo last week. For the Upper Permian, how the rocks affected the landscape is just as interesting as their composition. To appreciate that, we will look at both the sedimentology, and the mother of all geological sciences: Tectonics. Long before I actually went to Svalbard the first time, I had seen on maps that the Van Keulen fjord had a big obstacle at its mouth: A narrow island, Akseløya, that almost shut the whole fjord off, but for two narrow sounds at each side. How did that Fjordblock happen? Svalbard is really far from everything, as this Google maps image shows. Svalbard is the triangle in the image center. Greenland to the West, Frans Josefs Land to the NEm and Novaja Zemlja to the East. Not the best image…but that reflects Svalbard’s position far North where weather is hard and even few satellites venture. 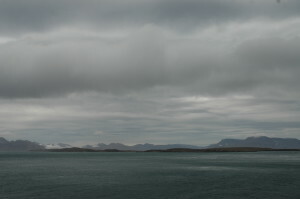 Akseløya is the thin Bulwark on the mouth of the Van Mijen Fjord, SW in the image. I got the answer many years later, and it starts with Permian rocks, continues with Paleocene tectonics and ends with Quaternary ice age glaciers. A good example of how geological events through a long time span create the landscape we see today – and also a world class locality for seeing rocks spanning 170 million years, all in one place: The Festningen profile, from the Upper Permian through the Lower Cretaceous. Confused as a cat now? That’s the point. So let’s go back to the Upper Permian. 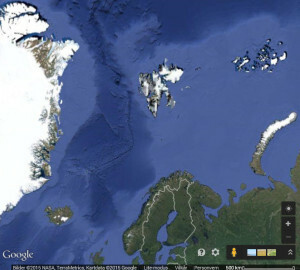 Climate on Svalbard got colder, as it drifted northwards. 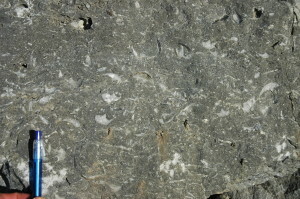 Coral reefs and Persian Gulf carbonates gave way to cold-water organisms, often together with thick layers of shells. You remember from the Carboniferous, that carbonates can become hard. Permian carbonates try even harder. For some time in the Upper Permian, sponges flourished, with skeletons made of silica needles, rather than of the usual carbonate. The hard needles created a rock reminiscent of an enormous haystack that consisted entirely of needles, which is extremely resistant to erosion. 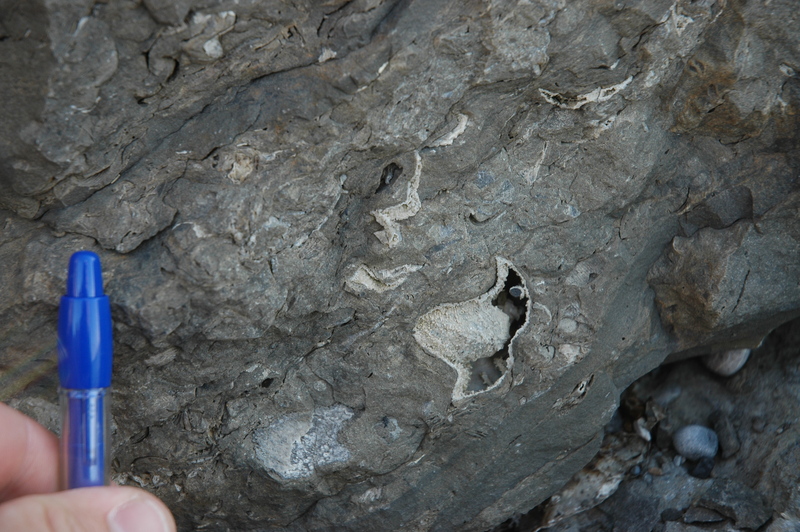 Brachiopodes in the hard Upper Permian silica-limestone, near Kapp Starostin on Svalbard. Brachiopdes are mussels With asymmetric shells, that dominated in the Paleozoic. 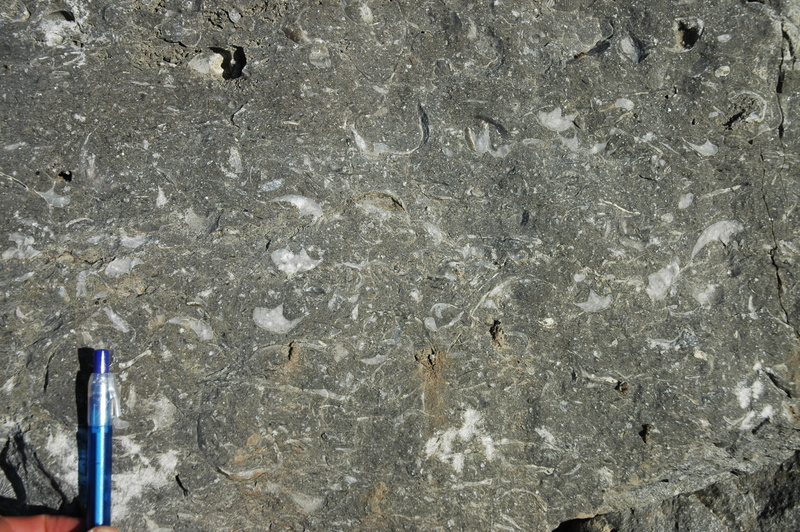 Another example of the hard silica-limestone at Kapp Starostin, full of brachiopodes. Starostinaksla, a mountain composed of hard silica-limestone. 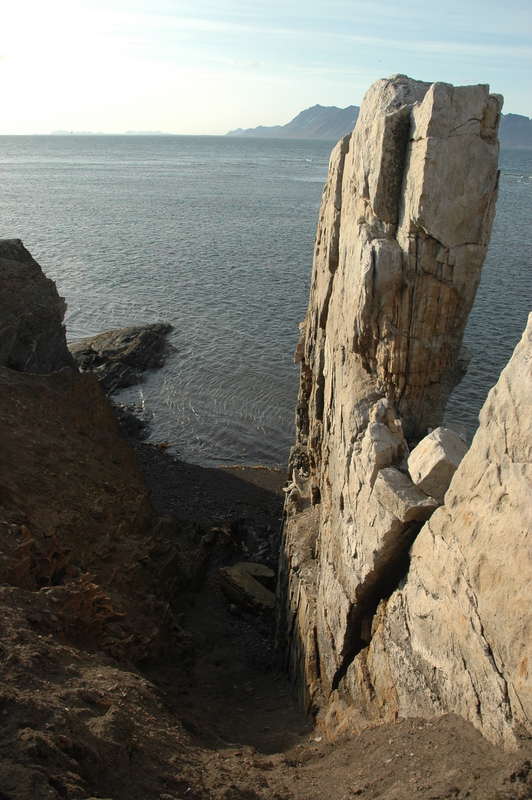 The mountain consitutes part of the Northern elongation of the rocks that make up Akseløya. The Big Break: The pen resides on the Permian-Triassic border, from the Paleozoic to the Mesozoic. Most of the world’s species died out at this border, and paved way for dinosaurs and, somewhat later, mammals. Coming the Triassic, carbonate gave way to marine shale. The clastic material was supplied by an enormous delta that built out from the East, the current Russia. Details of the Triassic are for the next blog post, but it buried the Permian rocks, and they stayed buried for the next 200+ million years, while the whole Mesozoic piled up on top. 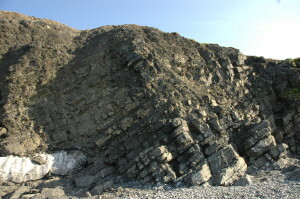 Towards the Uppermost Permian, limestone began to give way to clastic rocks, mainly shale. A huge delta started building out from Russia; it did not reach Svalbard before well into the Triassic, but supplied clay to make shale. 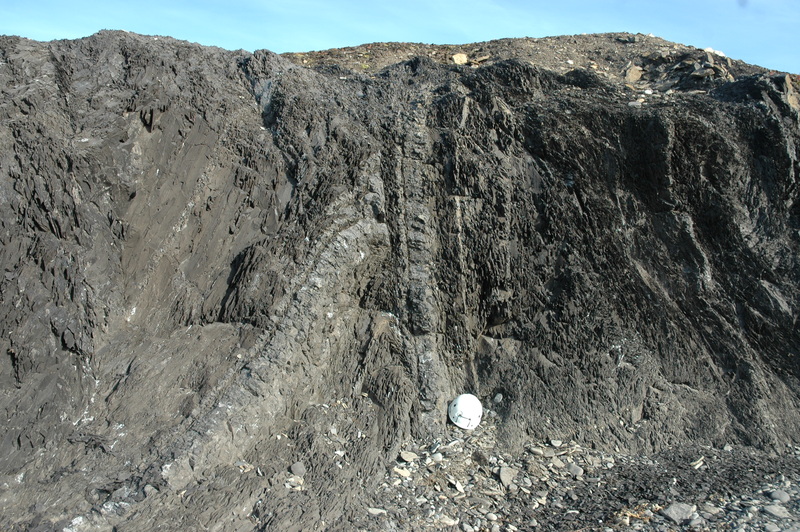 Triassic shale and some sand in the Festningen profile, tilted vertical by the Greenland collision. We will take closer looks at the Festningen section and the clash with Greenland in later blog posts. Then, Greenland came along and messed things up. Until the late Cretaceous, Svalbard was actually located northeast of Greenland, relatively speaking. The opening of the Atlantic ocean started in the Jurassic, in the Caribbean, and moved gradually northwards, as opening a scissor. Svalbard happened to be behind the hinge point of the scissor, where there suddenly (just a few millions of years) became too little space. Svalbard slid south-eastwards to escape, squeezing past the east tip of Greenland. Squeeze the Earth’s crust, and you press up a mountain chain. The west coast of Svalbard became a mini-mini-Himalaya, where the previously nicely flat rocks were thrusted into stacks here, folded there, and generally messed up. The Spitsbergen fold and thrust belt, as it is called, became a dream for a structural geologist like me, but some places a nightmare for sedimentologists that try to correlate across all the faults and thrusts. Between Van Keulenfjorden to Festningen, the geological layers were tilted into the vertical, with the old basement in the west, and then younger-wise from the Permian to the Cretaceous eastwards. One can walk from the Permian to the Cretaceous along the shore of Isfjorden, and see how the rocks change from Permian shallow water with mussels, to the deeper marine Triassic with ammonites (extinct nautilus octopuses), then more and more sand into the shallower Jurassic. Cretaceous fluvial sands with dinosaur tracks are the icing of the cake, on this beach walk through 170 million years of rocks. 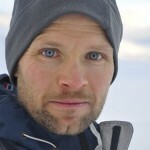 The Festningen profile is a world class locality, and we will take a closer look in the next blog post. 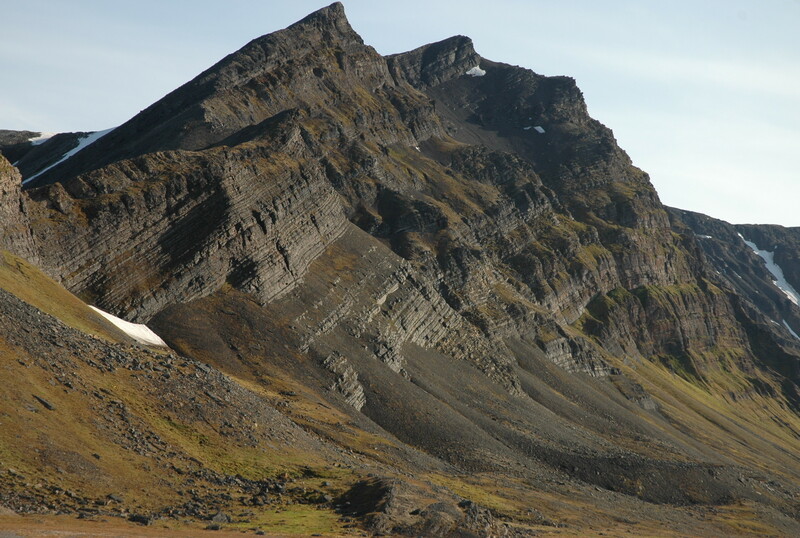 A teaser from the Festningen profile: The white stack is a Lower Cretaceous sandstone, deposited in a river, and with dinosaur tracks. It was tilted into vertical by Svalbard’s crash with Greenland. For now, back to the Permian rocks, which Greenland turned into a long, hard wall from Festningen to Van Keulen. There they stood for another fifty million years or so, as the mini-mini-Himalaya got eroded and filled the big, gentle foreland trough. Then came ice ages and glaciations towards the end of the Cenozoic, and started digging out the fjords. Isfjorden is the largest. 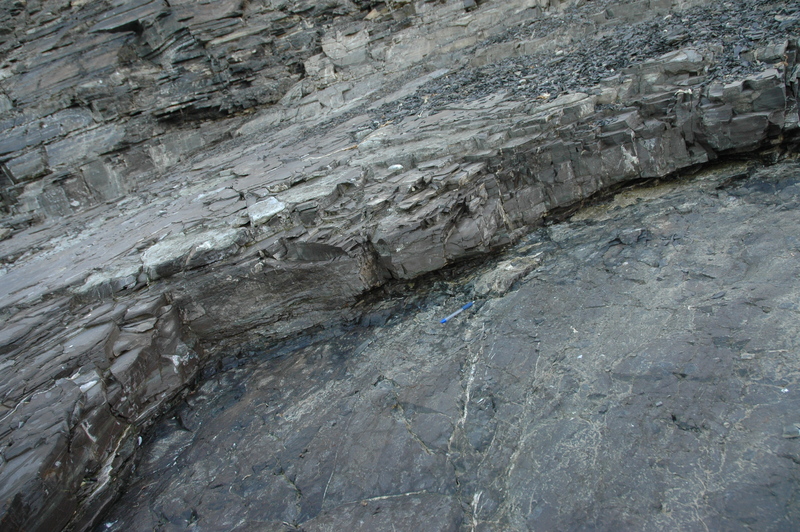 Wijdefjorden on North Svalbard follows the weakness zone created by the northward extension of the Billefjorden through faults. And Van Keulen, the fjord with the Fjordblock. The soft Cenozoic and Mesozoic rocks, shale and sand were easy prey for the glaciers, but the hard Permian put up resistance, and the Van Keulen fjord got Akseløya as a bulwark towards invaders. Today, ships that sail by to load coal from the mines in Svea, at the bottom of the fjord, have to be special builds, small enough to pass through the small sounds on each side of the island. And Akseløya itself is home to a hunter-trapper anda zillion eiders, which probably do not care about its long history in the making.